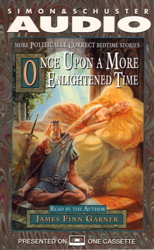 Spurred by the overwhelming success of the million-copy bestseller, Politically Correct Bedtime Stories, James Finn Garner continues his quest to liberate 'classic' fairy tales from their archaic, sexist, ageist, classist, lookist and environmentally unsound prejudices. In Once Upon A More Enlightened Time, Garner tackles many demeaning, culturally biased viewpoints through his retelling of such well-known tales as 'The Princess and the Pea' and 'The Tortoise and the Hare.' He has striven to fashion these bedtime stories into literature that is totally free from bias and purged from the influences of a flawed cultural past in hopes of freeing our social consciousness from these blights.